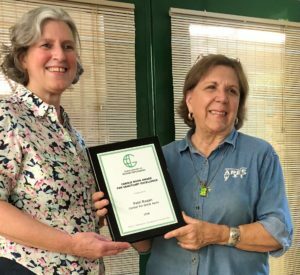 The GFAS Carole Noon Award for Sanctuary Excellence is given annually to an individual who embodies and puts into practice the GFAS philosophy of vision, dedication, and excellence in animal care at sanctuaries. The award was created in 2009 to honor outstanding contributions to the animal sanctuary field to memorializes Carole Noon, Ph.D., a courageous and innovative sanctuary pioneer and champion of chimpanzees. Patti is dedicated to the health and welfare of chimpanzees and orangutans who unwillingly served the entertainment and biomedical research industries. At the Center for Great Apes, the only accredited sanctuary for orangutans in North America, apes who were former “pets” and performing animals are cared for with compassion and provided for their specialized needs. Dr. Sanchez is a veterinarian and oversees YIARI’s orangutan center on Borneo and the Primate Rehabilitation Center in Ciapus near Bogor in West Java. The Yayasan International Animal Rescue Indonesia not only works to protect orangutans, but also rescue, rehabilitate and release slow lorises, macaques and other imperiled species. Dennis Janik of GFAS-accredited Rescate Animal, an animal rescue center in Costa Rica, was singled out for his innovation and leadership in supporting the welfare of native wildlife as a caregiver, conservationist and advocate. 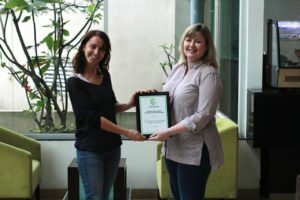 Amanda Lollar of GFAS-Accredited Bat World Sanctuary is the eighth recipient of the Carole Noon Award for Sanctuary Excellence given annually by Global Federation of Animal Sanctuaries. Amanda was singled out for her leadership in supporting the welfare of bats as a caregiver, educator, and advocate. Bobbi Brink of Lions Tigers and Bears (LTB) was singled out for her widespread work dedicated to supporting the welfare of displaced exotic big cats and bears and advocating for change to protect captive exotic animals in the future. Her work on the Sparky Project this year exemplified the true spirit of this award. She has been an ongoing inspiration in the horse rescue community but went above and beyond to help support the placement of a herd of 40 neglected, unhandled horses. Pat Derby was a strong advocate for sanctuary standards and helped to found The Association of Sanctuaries (TAOS), which was a predecessor to GFAS, building on what Pat helped to create. Ms. Derby battled the use of wild animals in the entertainment industry and exposed the cruelties inherent in the use of captive wildlife in Las Vegas acts, circuses, and roadside zoos. And while she worked tirelessly to end the cruel exploitation of performing wild animal acts, she is perhaps best known for her work rescuing and providing lifetime care for wild animals in the sanctuaries she helped start in California. While she was a guardian of numerous species including bears and big cats, her greatest love was elephants, for whom she cared with the love of a parent. She and her life partner, Ed Stewart, who accepted the award on behalf of Ms. Derby and PAWS, created the nation’s first sanctuary for elephants. “Pat’s legacy is one of compassion, vision, and dedication and she is an example for all sanctuary directors and employees to follow,” stated Mike Markarian, GFAS Vice President. Stany Nyandwi has always demonstrated remarkable courage and dedication. When he first began work, he bicycled 4-6 hours to and from work each day. The trip was dangerous during tribal conflicts, and two co-workers were killed. At tremendous risk to his own life, he smuggled chimps to safety in Kenya. For four years, keeping the chimps safe, he could not communicate with his family and did not even know if they were still alive. Stany has demonstrated insightful vision, pioneering ways of integrating new chimps into one large, cohesive group on 95 acres. The first award, given in 2009, was awarded posthumously to Dr. Carole Noon. Carole Noon, PhD, exemplified the GFAS philosophy with an innovative spirit, creating solutions to overwhelming challenges; a deep knowledge of those entrusted to the care of the sanctuary; and a dedication to animals and a determination to succeed that manifested in a commitment to ensure humane and responsible care for the lifetime of each of the sanctuary residents. Every year we solicit nominations through the end of May (nomination period is closed for 2017). Please state in 500 words or less how the nominee exemplifies the traits listed above (vision, dedication, and excellence in animal care). The GFAS Award Committee reviews all nominations and makes a recommendation, which includes past recipients or representatives of past recipients and members of the GFAS Board of Directors. The full GFAS Board of Directors then makes the final selection. The award recipient is honored at a ceremony, receives an engraved plaque, offered an award, and is offered membership to the Award Committee.